I'm using ancestry.com DNA, GEDmatch, and family trees of my matches in hopes of using DNA triangulation to find my ancestors. In addition, I have a half-sibling who also had his DNA tested which allows me to find common ancestors on this side of the family. In other words, you and your half-brother should be able to figure out what part of your DNA came from your mom. And if you subtract out that shared DNA, what is left must have come from your dad! My first thought was that a person and their half-sibling wouldn't inherit exactly the same DNA from their mother, could they? For example, the mother has two different alleles for some trait. Her son could get a copy of one and the daughter could get a copy of the other. Therefore, in the author's example, how could subtracting out the shared DNA with the brother give the girl the ability to identify exactly which DNA must have come from her dad? One brother inherited the green version of the mother’s chromosome 2, while the other brother inherited the blue version. This means that none of the chromosomes match! So testing wouldn’t tell the brothers which version of chromosome 2 came from which parent. It turns out, though, that it’s really unlikely that siblings would have two totally different versions of a chromosome. This is because of something called recombination. She's talking on entire chromosomes here which is different, but it doesn't seem to address fully why the girl should be able to 100% identify what DNA came from her dad by subtracting the shared DNA with her brother. I read that half-siblings share 25% of the DNA, but the mother here surely contributed more than 25% to each of her children. In practice, my half-sibling shows a genetic relationship to people on our shared parent's side that I do not (and likewise, I have genetic relationships to people on our shared parent's side that he does not.) Therefore, I'm positing that my brother and I each inherited some different DNA from our shared parent. Consumer autosomal DNA tests do not identify which of the two chromosomes present in the sample a detected variant can be assigned to. The tests show only the two variant values detected at each location tested, and not which chromosome they come from. Using this data from two tests, comparisons can show stretches of chromosomes which have matching patterns of variants which indicate with good probability that the corresponding pieces of chromosome have the same origin. The tests do not tell you about the source of the pieces outside these stretches. Each of two half-siblings do get half of their autosomal DNA from their common parent. 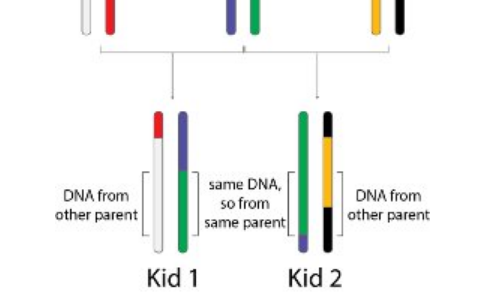 On average, half of the DNA each gets from that parent will also be inherited by the other half-sibling, and so will show up as matching stretches when the tests are compared. Thus half-siblings will show around 25% shared DNA (around half of the 50% that comes from the shared parent). Given a matching stretch of DNA results, one can determine the DNA variants that came from the other, non-shared, parent for the locations within that stretch of chromosome. However, the locations outside the set of matching stretches cannot be identified with a particular parent (without testing of the parents). By finding the shared DNA, the brothers can find the pieces of the 23 chromosomes that came from their shared parent, just like we did for chromosome 1. Any genetic information from the DNA on the corresponding sites on the other 23 chromosomes will tell the brothers about their fathers. Outside of these two places the web page seems to mislead one into thinking that all the DNA can be associated with the correct parent, which is not the case without the parents being tested. Not the answer you're looking for? Browse other questions tagged human-genetics or ask your own question. Generating custom human DNA sequences based on traits such as eye colour? Prader-Willi Syndrome and Angelman Syndrome? How should one interpret heritability? Is it related to $R^2$? If a mother had a child with her own son, could a paternity test yield positive result for the son's father? Can you do DNA seq with Microarray?